Trio Nine (formally Hi Lo Trio) from Phoenix, Arizona play experimental, drone based improvisational music. They are now in their third year of a residency at Paisley Violin in Phoenix performing along side a silent movie every Thursday night from 7:30 to 10pm. They also perform at other events, art openings and galleries in the Phoenix area. Trio Nine came together in 2008, when Jimmy Peggie, following the thread of free form improvisations he was exploring in with a loose confederacy of musicians calling themselves Free Tribes, joined up with longtime tenor saxophonist and guitar-wielding Subterranean Jazz bandmate, Tom Clohessy, and freestyle drummer Tommy Lowery to play a Thursday night gig at the Paisley Violin on 11th and Grand in Phoenix. The band had no pre-conceived style in mind but sought to play intuitively; listening and bouncing ideas off of one another and following the ensuing trails . Riffs, grooves, and tonal centers emerged that would serve as loose guideposts but the emphasis was on the moment.. The name “Hi-Lo” seemed to be fitting for music that was High intensity and Low in volume. In 2009 Tommy left for Chicago and Steve Jansen joined up. Steve had been working as a “sound and noise” player, forging his wizardry with recorded and and live sound textures, voices, and tape manipulations. The sound of the new group was much the same as before, with less overt rhythm and more texture and ambiance. Highlighting the summer of 2009, the trio together with Subterranean Jazz drummer, Dave Sorensen, flew out to Chicago where former member Tommy Lowery had arranged some live performances. With Tommy joining the group together on drums with Dave on percussion and drums they played as a quintet and the stage was replete with every sort of instrument and sound making device. A grand time was had by all and audience response was phenomenal. 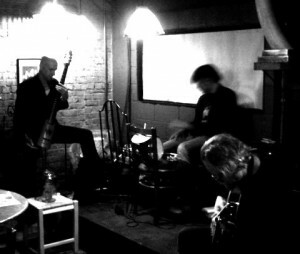 Trio Nine has just recorded their first CD…….with Jimmy on electric bass-cello, viola da gamba and electronics, Steve on tape manipulation, sonic hoarding, vox, delays and loops, Barbie guitar, decaying analog noisemakers, and Tom on guitars and tenor saxophone. Trio Nine is an experimental, improvising trio performing at art events, galleries and other bohemian events! Trio Nine have released a new CD called Incandescent Cinema – listen and buy here.